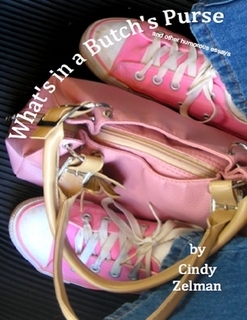 What’s in a Butch’s Purse and other humorous essays is no longer available for purchase at this time. There will be an announcement when the book becomes available again. Originally the chapbook was a winner in creative nonfiction/mixed genre in 2013 writing contest sponsored by Winged City Chapbook Press. Published in 2014. “This Time I Fell in Love with the Daughter,” published by The Broken Plate, the literary journal of Ball State University. Spring 2015. My book review of Message from a Blue Jay by Faye Rapoport DesPres, was named one of the 5 best book reviews in the August 2014 Retrospective Issue of Connotation Press: An Online Artifact. “The Square Root of Anger,” Honorable Mention Award winner in Creative Nonfiction from New Millennium Magazine’s 37th Writing Awards in 2014. “Peanut Butter Cups,” essay published by Tinge Magazine, December 2013. “Once an Agoraphobic,” Honorable Mention Winner, Writer’s Workshop of Ashville, September 2013; published online at it’s all in her head: woman making peace with troubled minds. April 2013. The link is no longer active. “The Cross Dresser,” Honorable Mention Award in the New Millennium 35th Writing Contest in 2013. “Stuck in the Middle,” in Cobalt Review, Volume I, October 2012. Finalist in Cobalt Writing Competition in Creative Nonfiction, and an Honorable Mention Award in the New Millenium 35th Writing Awards in 2013. “Marcela Songs,” Connotation Press: An Online Artifact, December 2012. “A Smirnoff and Coke,” Connotation Press: An Online Artifact, November 2011, chosen as one of 10 essays for the Connotation Press annual retrospective issue in 2012, and a semi-finalist in the New Millenium 35th Writing Awards in 2013. “Janbradi@aol.com” The Whistling Fire, August, 16, 2011. No longer available on-line. “Women Imagined,” Sinister Wisdom, Volume 76, Summer 2009. “Hands,” The Lesbian News, Volume 22, No.5 December 1996. “Hands” was entered into The 2nd Great Plains Readers Theatre Festival, November 9, 2001 capturing Fourth Place. “Our Menstruation,” Feminist Studies, Volume 17, Number 3, Fall 1991. Portions of “Our Menstruation” reprinted in Literary Anatomies: Women’s Bodies and Health in Literature by DeleseWear (Author), LoisLacivitaNixon (Author), State University of New York Press, 1994. Portions of “Our Menstruation” reprinted in Women’s Experiences: A Psychological Perspective, Frances Elaine Donelson, McGraw-Hill, 1998. “Our Menstruation” is listed in the Literature, Arts, and Medicine Database of NYU. “Our Menstruation” listed as required reading in class syllabus, DePauw University, Religious Studies 271: Feminist Theologies, Fall 1998, Professor Valarie Ziegler. GAY e-magazine: Web site is no longer active. “Who is Marriage For?” Bay Windows, originally an essay entitled, “Marriage is for Illiterates,” published, December 9, 2004 in editorial section. Articles published in 2008 “Going Solar” and “Sound, Sight, and Action,” a profile of the arts in Westerly, RI. Local and Regional papers: for more than 20 years, I have published regularly in local and regional papers. Select articles available upon request.